Watches come in all shapes, sizes, colors and are manufactured all over the world. This week’s blog will focus on the watches of Russia. 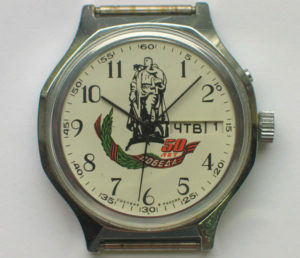 Soviet watches and clocks have had an important history in timekeeping, as they provided time signals for navigation and targeting by aircraft and naval vessels, timed world chess matches, coordinated traffic on Trans-Siberian Railroad and were the first timepieces in space. My personal motto is that Russians make good vodka, but lousy watches!. Don’t forget that Russian watch industry is still in a phase of rebuild, as the Cold War ended just some 25 years ago, which had a significant impact on many Russian industries, including the watch industry. Russian watches were built mainly to be cheap and simple. More precisely, the creation of Russian watches were born from a 1930 idea of Joseph Stalin’s that the Soviet Union could limit Western imported goods while bringing efficient time-keeping throughout the country. When Soviets went to space in 1961, on their wrists they were wearing Poljot watches, which was the first watch company created under Stalin’s directive. 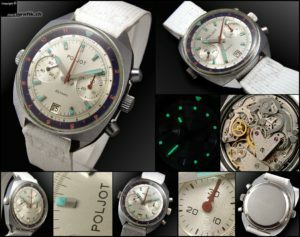 Poljot is probably the most prestigious Russian brand, because it produced mechanical chronographs, the main desire of all the watch collectors. Soviet-made Poljot were simple but well built. After the fall of USSR, Poljot immediately launched new and attractive models, apparently with better materials, but often with unadjusted movements. This led, for example, to many watches with badly working chrono functions (early Aviator series). After the Soviet Union collapsed, the Raketa factory went bankrupt. The company still produces watches and movements, but the finish of the cases and dials was very rough. 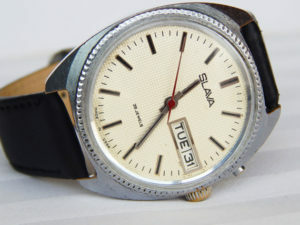 Famously, it produced a signature watch for the 1980 Moscow Olympics. Vostok, founded in 1942, is the oldest Russian watch company and produced robust, simple timepieces. After the fall of the Soviet Union, there was a downfall of quality (broken movements and loss of chrome on chrome-on-chrome plated cases). Vostok filed for bankruptcy in 2010. 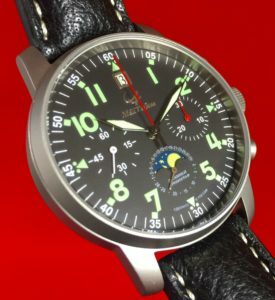 Pilot watches are comparable to Poljot watches of some years ago: made from good quality and materials, but sometimes have some assembling defects. Slava is working with an expiring stock of movements, while Maktimem is a relatively new brand. Mark, always enjoy reading these entries, and I’ve really enjoyed working with you. You serviced my Panerai and I bought an Omega from you. Regarding Soviet timepieces, I have a Sekonda Strella, circa 1960’s, that I’d like to have serviced. Manual wind, chronograph. Would you take that on? I’d be happy to send it for you to evaluate…if it’s not cost-effective for you or me to proceed, no problem, but maybe you could take a gander first? Interesting as always. I have a seldom worn manual wind Poljot which is made to look like an Omega Dynamic, and an automatic 40 mm 35 jewel Dolphin with a 2 tone 24 hour dial. Thank you Mark. Appreciate the essay on Russian watches. 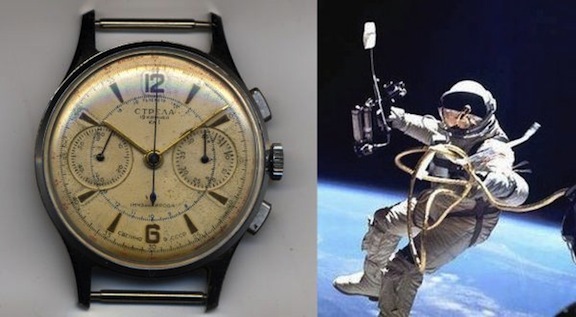 My wife bought for me back in the 1980’s ( pre internet /e – bay days ) a 3 complication Soviet Cosmonauts watch. I went through 3 repair cycles because the stopwatch function would jump to 5 seconds when started. I used to say that’s why a number of cosmonauts were lost on re entry; Five seconds off and you’re literally toast. I did see a watch that was supposed to be a Soviet fighter pilot watch that had a heating unit built into it – plugged in a power cord from what I gather is a very cold cockpit. To my regret, I didn’t purchase it and I’m still looking for it. One of my daughters though, just bought me a simple automatic Russian watch that commemorates the Russian cosmonauts. Been wearing it for more than a month now and it keeps excellent time and runs for about a day and half on one winding. Bought a USSR vintage Vostok Submarine Commander model in a thrift store for 25 cents because it wasn’t running. Owner said it needs a battery. Went home, wound the watch, and it ran pretty well (+/- about a minute a day). Wore it for a month, and actually got more comments on it than on my Rado Ceramica. The Vostock is really a “nothing special” watch, but it is unusual and fun. A lot of these went to Italy in the late 80s where they developed a semi-cult following as the “Anti-Rolex” – a sporty/dressy watch with some of the Rolex styling cues but at a tiny fraction of the Rolex price. If the strap says “Made in Italy”, it is one of those. 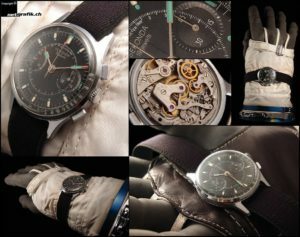 Parts, including complete new movements, cases, crystals, dials, hands, are available all over eBay, and are not expensive at all. Always informative and interesting Mark, thank you. just like the Soviet “space shuttle” and the Tu4. Did they also reverse engineer the Soyuz? Probably the best space vehicle ever designed. I have many Soviet and Russian watches. The best space vehicle ever designed was the Shuttle. The Soyuz was probable reversed engineered from our early programs when we used capsules. Picked up a Raketa for $14! Looks alright, runs well and is accurate. Did not include strap. 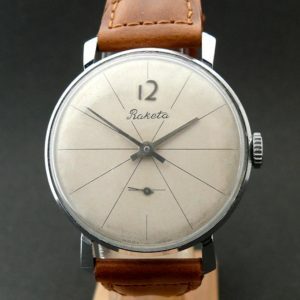 The Petrodvorets Watch Factory Raketa http://www.raketa.com modern watches since 2010. I have a mid-1980s Molniya pocket watch which needs to be repaired. Do you do this? Parece-me abusivo considerar que os relógios “russos” (fiquei sem saber se inclui os da USSR) são aus, e (. )ponto final. Só quem não percebe nada de relógios (o que não parece o caso) ou que é de tal forma estúpido que só vê a ideologia à sua frente. Penso que o crescimento das pessoas também passa por ler estas criticas. I have a typhoons submarines chronograph watch w titanium case.no band however. There are some really great Russian watches. The new Raketas seem a bit overpriced. 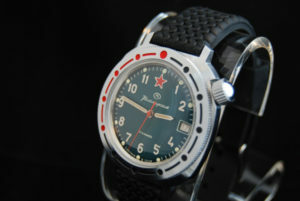 There are some good Vostok Special Editions available from meranom.com.